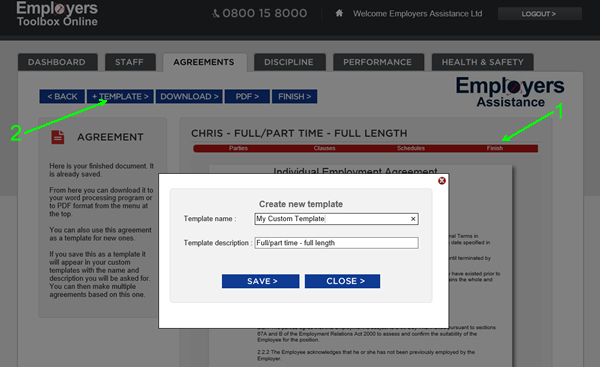 A popular feature of the Employers Toolbox online is the ability to create custom Employment Agreement templates. 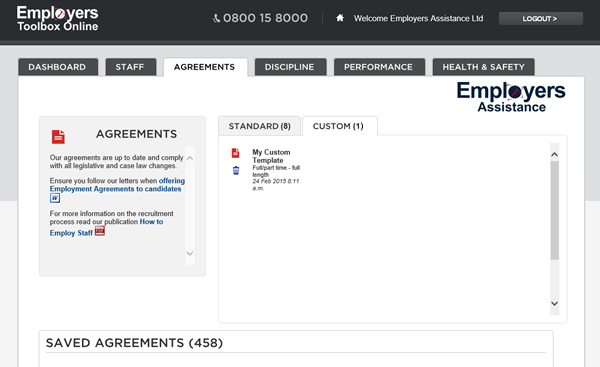 Custom Templates are displayed back on the homepage of 'Agreements' under the label 'Custom'. Simply click on the custom template to generate a new Agreement based on your custom template. Any optional clauses written by us can be removed from the Agreement by de-selecting the check box next to the clause. You cannot edit or change a custom template once saved. The way to change a custom template is to create a new Agreement based on your custom template, then make the desired changes and save it as a new custom template. You are able to delete custom templates. Saving an Agreement as a custom template retains all the changes in both the clauses and schedules of the Agreement. Only the Party information is removed.